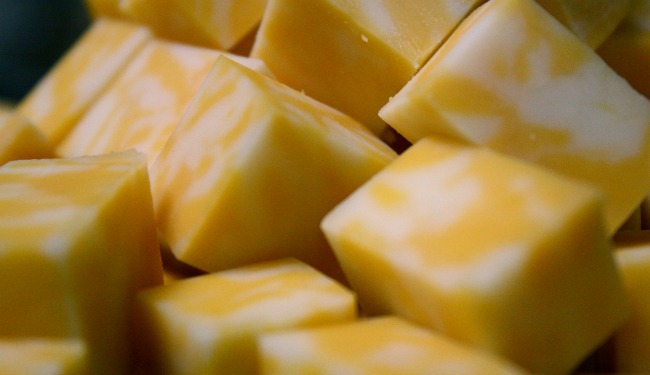 The average American eats almost three times as much cheese today as in 1970. Yesterday the Center for Science in the Public Interest released a "report card" on U.S. eating habits, entitled "The Changing American Diet." In The New York Times, Jane Brody called our performance therein a disappointment. That depends how you feel about D-pluses, I suppose, and cheese. The report's dairy chart tells us the average U.S. consumer is, at 23 pounds per year, eating more than the occasional cheese dip. In 1970, the number was about eight pounds. 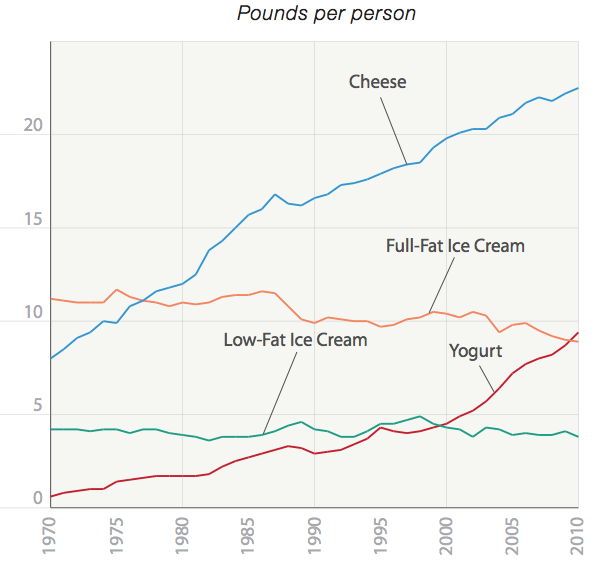 In relative terms, yogurt's rise is even more impressive, but yogurt isn't the kind of thing that defines a nation. It's also a lot of low-fat and non-fat stuff, which, as long as it's not loaded with sugar, should be of less cardiovascular consequence than cheese. Dairy Management, which has made cheese its cause, is not a private business consultant. It is a marketing creation of the United States Department of Agriculture — the same agency at the center of a federal anti-obesity drive that discourages over-consumption of some of the very foods Dairy Management is vigorously promoting. Urged on by government warnings about saturated fat, Americans have been moving toward low-fat milk for decades, leaving a surplus of whole milk and milk fat. Yet the government, through Dairy Management, is engaged in an effort to find ways to get dairy back into Americans’ diets, primarily through cheese. ... In a series of confidential agreements approved by agriculture secretaries in both the Bush and Obama administrations, Dairy Management has worked with restaurants to expand their menus with cheese-laden products. Consider the Taco Bell steak quesadilla, with cheddar, pepper jack, mozzarella and a creamy sauce. “The item used an average of eight times more cheese than other items on their menu,” the Agriculture Department said in a report, extolling Dairy Management’s work — without mentioning that the quesadilla has more than three-quarters of the daily recommended level of saturated fat and sodium. That's the story that became the hook for Moss's book, released earlier this year, Salt Sugar Fat: How the Food Giants Hooked Us. Possible rejected tagline: Who are the real cheese-eating surrender monkeys? In July, Dairy Management released a report on its next initiative: stemming our lack of interest in milk. "From 1975 to 2010, annual per capita fluid milk consumption dropped from 28.6 to 20.9 gallons. ... It’s been a painful time for the fluid milk industry." Dairy Management remains partnered with McDonald's, Pizza Hut, and Domino's "to create new and innovative products using dairy to delight consumers."